Pick Your Best Prospects Out Of The Crowd! As small business owners, prospecting is the name of the game. The very life blood of your business, especially if you’re operating an internet-based enterprise. Here are the rules of the Internet prospecting game, according to The Father of Social Networking, Max Steingart. Rule #1. It’s not only how many prospects you have, but the quality of those prospects. Rule #2. If you buy leads, classified ads, mass email lists or safe-lists as tools for prospecting then please go back to Rule #1. Rule #3. 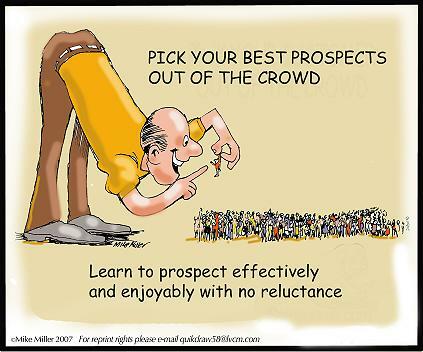 Success in prospecting depends on knowing where to look for the right people to put into your business. Rule #4. The right people want very much to know more about what you’re offering. Your job is to find them before they talk to someone else. Rule #5. The future of effective prospecting is on the Internet. Your understanding of this will put you farther ahead faster. According to Max, the real trick is for you to adapt these rules to your own business so that you can grow now, a month from now, and forever. WHYTE-HALL COMMUNICATIONS offers FREE press release services for small business owners, entrepreneurs, consultants, professionals, and charity organisations at SmallBizNews. To include your small business product or service, or charity activities, first send your press release toexposurenews@gmail.com. ← New, Cost-Efficient eMedia Kit Service Has Publicists, Small Biz Owners and Entertainers Smiling & Getting The Media Attention They Deserve!